It is a truth universally acknowledged that if one sees an impossibly long line at an airport, it is one’s destiny to stand in it. Not that it occurred to the group of shiny-eyed from the red-eye Canadians (myself included), as we skipped past a queue that stretched half way through the terminal block. Only when we reached a sign that said “EU passports ONLY” did we realize that the line we passed was for us – the foreigners (travelling on a Canadian passport has its downside!) – and we had to trundle all the way back to the end of the line. Two hours after touchdown in jolly old England and we made it through passport control. Nothing breeds camaraderie like shared frustration and I made a few friends, most of them coming to London to study. We were so long in coming through security that our bags had been taken off the carousels, my backpack slowly suffocating in its plastic wrap. I released it and almost toppled backwards when I threw it over my shoulder – a fact that does not bode well for the rest of the trip. I made it through to the trains to catch a train to Professor Flitwick station to meet my cousins and their adorable baby in Woburn Sands. Woburn Sands is a village located within the broader infrastructure of Milton Keynes. It’s located north west of London, about an hour away on an express train. One of the most famous sites around Milton Keynes is Bletchley Park, home of the WWII Code and Cypher School. 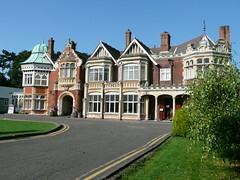 Bletchley Park is best known for breaking the German enigma machine. Despite my love of spy-themed entertainment (who hasn’t wanted to work for MI:6? ), I wasn’t sure how much Bletchley was going to have to offer me, considering the drop off point is at a low, drab-looking concrete building. My first thought was “surely this can’t be worse than the Diefenbunker?” But in fact it was one of the most interesting museums I have ever been to. The work that they did at Bletchley Park was incredible – and the fact that it was kept a secret well after the war just heightens the importance of code-breaking. Over 8500 people worked at Bletchley during WWII, of whom 6000 were women. And it was a man who eventually spilled the beans on Bletchley – just thought I’d mention that. The tour was by far and away the most interesting part of the whole museum. Not only did I meet a fellow Canadian student (from Mississauga – small world!) but an older (much older) gentleman on the tour who actually worked at Bletchley during the war, in hut #6. Every so often the guide would mention a fact that would jog the man’s memory, and he would tell a personal story about what had been going on during the war. It was fascinating. There’s an incredible man at Bletchley Park named Tony Sale, who rebuilt a Colossus computer from scratch. The Colossus was the first computer ever built – the British did it first, not the Americans! (A point often reiterated). The British, however, had to keep their computer a secret. The reason was that the Colossus could break twelve-turn Lorenzo code machines (as opposed to 3-turn, which the enigma machine produced). There were 159 000 000 000 000 000 000 (that’s 159 million million million) different possibilities in Enigma – which Hitler deemed as impossible to break (which is why Bletchley worked so well – because Hitler never suspected them of having broken his code). So if Enigma was 3 and produced that many possibilities, imagine 12! The Russians knew that the British had broken Enigma, but did not know that they had a computer capable of breaking the Lorenzo. It was necessary to keep the machine quiet even when the Americans declared they had the first computer, because breaking codes was equally as important during the Cold War. Okay, so I’m a little caught up in all this spy stuff but the salient fact here is that all the computers and code breaking machines were dismantled after the war in a strict order from Churchill. But from 8 black and white wartime photographs and some sketches that were illegally kept by the engineers, Tony Sale has rebuilt a fully functioning Colossus machine. In a word: cool. To see more: Tony Sale’s website. How dare ye walk on the grass! 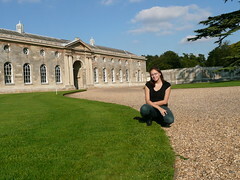 As if that wasn’t enough for one day, I took the bus into the village of Woburn to walk to Woburn Abbey. The walk was lovely, and it was a perfect English day (if there is such a thing). I reached the stud farm (it sounds exciting but please – it’s for the deer!) and looked around some of the rectory cottages. Then I tried to find the Abbey, without success. Upon asking someone at the desk, she informed me that there was no way to reach there on foot. How dare I want to walk through the grass! Seeing the disappointment on my face, she immediately dialled up the ticket office at the Abbey and had the ticket officer drive down to pick me up in his car – brilliant! I made it to Woburn Abbey just before the last admission time of the day and got a chance to look around, with the whole place mostly to myself. Being aristocracy must be a funny life. The Duke of Bedford and his family still reside at Woburn Abbey, but one wing is open to the public. Everything is ornamental. The ceilings and walls glint with gold and old men and women (with really bad hair) stare down at you wherever you walk. But it is beautiful. And if you are an aristocrat in the 1800s and want to buy some exotic animals for your backyard… a tiger, a warthog, an elephant… go right ahead, because later on your descendants will turn it into a safari park. I didn’t go to the safari park. I figure I will be on a real safari in a week’s time… why spoil it by seeing one in England? 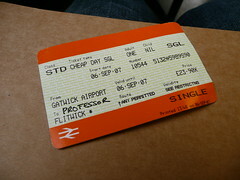 Tomorrow takes me into London, to see Sarah and meet Jason. The weather here is gorgeous and I couldn’t ask for a more perfect start to my months away. Be sure to look at my flickr account, because I uploaded some new photos of England. I’m about to start a book called “Backpack” by Emily Barr.